Striking color, piquant herbal flavor. Strikingly green and a delicious cheese! 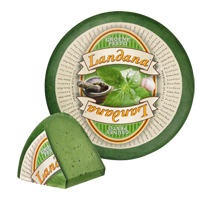 Amaze your guests with this mild green Dutch cheese with basil and a hint of garlic. Also delicious and exquisite in various dishes, especially pasta.